Have you ever picked up a pair of what you thought were nice dress pants only to be confused when others seem to find them to be more casual? Or have you ever bought a pair of pants in general just to be unsure about what type of material or style of pants they even are? It can be very confusing to learn about the different types of materials that both casual and dress pants are made out of, making it more challenging to buy clothing that is appropriate for your needs. For example: what are twill pants and what type of events are they suitable to be worn at? Let’s start deciphering the world of dress pants with this simple question. Many people will be surprised that twill does not refer to a specific material used to create pants but rather pertains to the technique that is used to create them. That said, twill pants are pants that are made using a twill pattern. Twill is made when the cloth is woven in a diagonal pattern, so materials can be called twilled if two or more vertical threads cross over two or more horizontal threads at a time. This technique causes a slightly ribbed texture, and the twill technique can be used with cotton, silk, wool, and more. This twill pattern technique is most frequently used to create trousers and jeans. That’s right! Jeans are often a type of twill pants! Denim is usually made by twill weaving blue and white threads together for that distinctive look, so most jeans must be considered to be twill pants. Are Twill Pants Formal or Casual? The formality of twill pants depends entirely on the fabric and style of the pants, not on the basis of them being twill or not. There are many twill dress pants on the market, and these pants would be considered casual for their clean look, fine lines, and high-quality materials. A pair of twill pants such as jeans though is less likely to make the cut when your goal is to select proper attire for a formal event. To decide whether or not your twill pants should be considered to be formal or casual, consider their color, cut, material, and overall look. Two of the most common types of dressy, twill pants are chinos and khakis. The level of their formality depends on the color and cut of the design that you are wearing. Generally speaking though, these two types of pants are best for office wear or casual business events. Work pants are typically twill pants that are made out of polyester or even a poly-blend material. On the other hand, high-end formal pants will be made out of gabardine or tweed twill fabrics instead of the less expensive cotton and polyester options that are available. These materials are considered to be of a higher quality than other low-end twill fabrics. Twill is not the only woven fabric type that is used to create clothing, but it is one of the most popular weaves when it comes to pants and formal wear. Why is that? When compared to plain-weave fabric, it’s easy to see that twill is more durable and resists wear due to the overlapping and diagonal style of its weave. This weave makes the fabric less likely to wrinkle, shrink, or show dirt easily. Additionally, twill usually has a lovely drape to it that is relatively easy to tailor. All-in-all, twill provides an excellent base no matter what material type it is woven with, and that is why twill pants and twill pattern weaves are used so extensively in fabric and garment creation today. What Is the Difference Between Twill, Chino, and Khaki Pants? Some people believe that twill, chino, and khaki pants are all different things. While each of these terms does mean different things, it’s not that they are all completely different! In fact, you’ll be surprised to find out how much similarity there is between these styles once you learn what they really are. Chino is a type of twill fabric, so when you talk about chino pants, you are actually talking about twill pants. Not all twill pants are chino pants, but all chino pants are twill pants. Khaki pants, on the other hand, are just a colossal category that can be used to describe any type of pants that are khaki in color. Khaki as a color is similar to the color of sand. Most often, khaki pants are made out of some type of cotton blend, but you can find khaki pants made out of everything from denim to twill. How Do You Take Care of Twill Pants? Now there isn’t a single answer to how you should take care of twill pants, as twill refers to the weave of the pants, and not the fabric. Your pants might be for dry-clean only, or they might just need to be tossed in the washer and dryer at home. Ultimately, you’ll need to check the tag to find out which of those situations apply. In many cases though, twill pants have a cotton blend which can be washed at home. To help them last for as long as possible, do not wash them every single time that you wear them. Instead, wash them in cold water and tumble dry the pants on low every few wears. The pants might lose a bit of their crisp shape or finish, but they’ll be clean and comfortable if you maintain them with this washing technique. 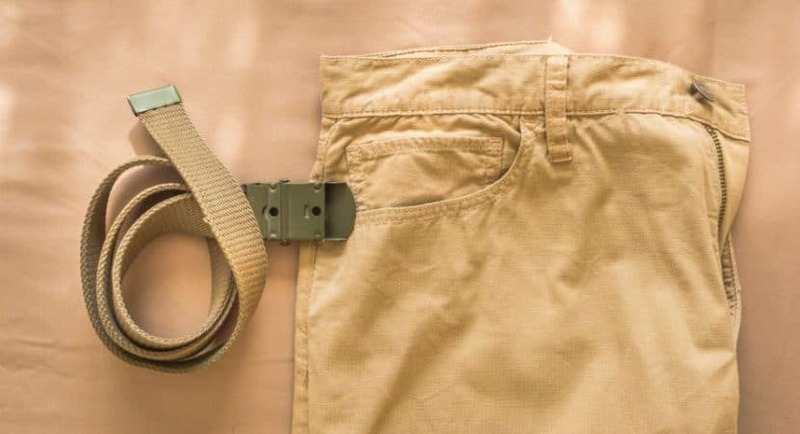 While you might not have known what twill pants were before reading this post, it’s probably safe to say you now realize that you’ve worn a few pairs of twill pants in your lifetime. Twill is an extensive category, and there’s usually a preferred style of pants that anyone can find that’s made in twill. Remember that twill does not define whether or not your pants are dressy enough for an event. Instead, consider the specific fabric type as well as the cut and color of the pants before deciding what’s appropriate to wear.